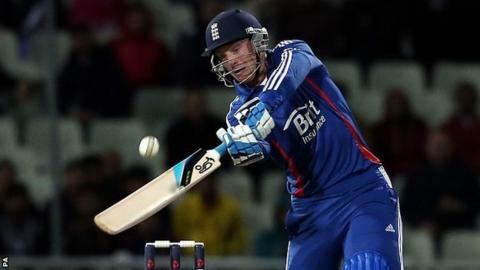 It was great to see England finish their home international season with a to square the Twenty20 series. The victory also ensures they jet off for the defence of their World Twenty20 title in Sri Lanka as the number one ranked team in this format. In keeping with all the one-day and Twenty20 matches between the sides, it was a one-sided contest at Edgbaston but England will be pleased that they produced the goods in a must-win game. "What a brilliant performance from Andy Murray to win the US Open on Monday night. I'd like to be able to say I watched it all but I have to admit that I fell asleep when he was two sets to one up and had to wait until the morning to find out he had won! I just hope now he can turn winning Grand Slams into a habit." The highlight for me was Craig Kieswetter, who underlined his growing maturity as an international cricketer with an excellent half-century at the top of the order. Jos Buttler, who has always impressed me when I've seen him play for Somerset but hadn't replicated that form for England in his limited opportunities, played one of the great Twenty20 cameo innings, with his man-of-the-match unbeaten 32 off 10 balls. Buttler's innings was the difference between the sides and the confidence he will have gained in that short space of time will do him the world of good in Sri Lanka and beyond. England carried the momentum gained from Buttler's innings into the second half of the game with some outstanding fielding and high-quality bowling, led by Graeme Swann, as they wrapped up a comfortable 28-run victory. Looking ahead to the World Twenty20, I don't have England down as one of the favourites because visits to the subcontinent can be very testing. Pakistan, Sri Lanka and India are the obvious contenders in familiar conditions, but I wouldn't rule out the chances of England, New Zealand, West Indies or South Africa. Of the major cricketing nations, it's only Australia who are still finding their way in this form of the game. I wouldn't see it as a major upset if Ireland turn them over in their opening game next Wednesday. "Congratulations to Warwickshire and their coach Ashley Giles on a well-deserved championship success. They were certainly the best and most disciplined team I saw all season and I'm sure they'll be keen to do the double by beating Hampshire in the CB40 final at Lord's on Saturday." I'd expect the pitches to be slow turners and therefore variety in the bowling attack will be paramount. You must also have players who can clear the boundary ropes with ease and the re-emergence of Luke Wright could prove pivotal to England's chances. When the tournament begins on Tuesday with hosts Sri Lanka taking on Zimbabwe, many England fans will have their attention closer to home with the Test squad for the India tour set to be announced on the same day. The biggest talking point will of course be whether Kevin Pietersen is on that list. I hope that between now and the announcement everything is done to resolve the issues surrounding the batsman because England are a far better team with him in it. Having said that, I appreciate that the good of English cricket has to come first both in the short and long term - and that will be the most important consideration in their decision. One name I hope to see in the squad is Kieswetter's. He has established himself as England's first-choice one-day and Twenty20 wicketkeeper and deserves to go as reserve to Matt Prior. Jonny Bairstow, whose keeping is still improving, would also get into my squad as a batsman but Kieswetter's greater experience with the gloves should earn him a place in the party.